Joyce Quaweay (left), 24, was beaten to death July 29, 2016, in the Germantown home that she shared with her then-boyfriend, Aaron Wright (middle), and his friend, Marquis Robinson (right), who was also their housemate. Both men are former Temple University police officers and are on trial in Quaweay’s death. Looking at the prosecutor, the 12-year-old girl, dressed in black jeans, purple boots, and a blue jacket, with braided hair, testified Tuesday about at least one time when she had been beaten by two men, and how they also beat two women in their Germantown home — one of whom died. On the morning of July 29, 2016 — the day 24-year-old Joyce Quaweay died — the girl remembered waking up to screaming in the house on Greene Street. The girl, then 10, and her sister, then 6, stayed at times at the home where Aaron Wright and his friend Marquis Robinson lived, with Quaweay, who was Wright's girlfriend, and with Robinson's girlfriend. 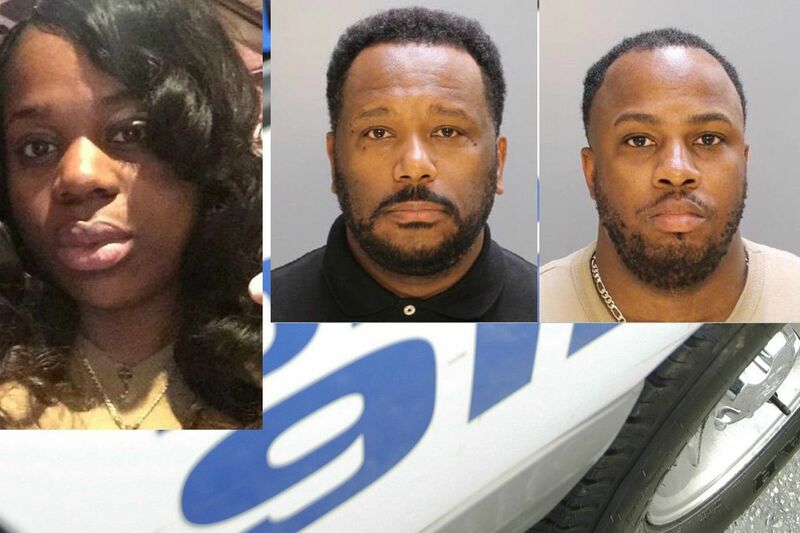 Wright, 49, and Robinson, 43, both former Temple University police officers, are on trial facing third-degree-murder and related charges in Quaweay's death. Wright had resigned from the police force in 2012; Robinson was fired after he was charged with murder. They also are charged with aggravated assault for the alleged beatings of the older sister. The prosecutor has not yet publicly stated a possible motive for the killing. The Inquirer and Daily News are withholding the girls' names to protect their privacy. Wright is the father of the younger sister; an ex-girlfriend is the mother of both girls. Speaking in a level voice throughout her two-hour testimony, the 12-year-old described a household in which she had been beaten with a belt or baton by both men at least once, and where she had seen Robinson's girlfriend beaten on an exercise bench. She herself was beaten by Aaron Wright "many times," she said. After she first heard screaming that deadly July morning, she said, she went back to sleep. About an hour later, Aaron Wright woke her to prepare breakfast for her younger sister and for Wright's and Quaweay's 2-year-old daughter, who also lived there along with the couple's 10-month-old daughter. In the kitchen, she said, she saw Quaweay lying facedown, naked and handcuffed on an exercise bench. Her feet appeared to be tied with white plastic zip ties. Robinson was next to her. "I got the cereal, the milk, the bowls," the girl testified as she answered questions from Assistant District Attorney Chesley Lightsey on the second day of the men's nonjury trial before Common Pleas Court Judge Diana Anhalt. Wright took a police baton and "he was beating her" as Quaweay was "screaming," the girl testified. She also saw Robinson beat Quaweay with the baton. She estimated that each man hit Quaweay 20 to 25 times. At times, Quaweay said she couldn't breathe, the girl testified, "so Aaron would pour water on her" face from a bottle. At one point, the girl testified, Wright told her to bring the three younger children downstairs. The girl said she fed the toddler breakfast while her 6-year-old sister ate cereal and the baby stayed in a playpen, all in the living room. She could still see into the kitchen and realized that Quaweay was moved from the bench to the floor. "After they took her off the bench, she wasn't saying anything," the girl testified. "She wasn't moving." Then, the girl said, her mother, who worked nights, arrived to get her and her sister. She recalled that Wright and Robinson tried to resuscitate Quaweay by performing CPR and that Wright told her mother to call 911, and an ambulance arrived. Albert Chu, the city's deputy chief medical examiner, testified that Quaweay died of "sudden cardiac death due to physical assault." Autopsy photos showed bruising all over her body. During a courtroom break, the victim's mother, Jackey Wea, of Providence, R.I., where Quaweay was born, told a reporter that her daughter had been employed by Northeast Philadelphia-based SPIN Inc. working with people with autism and intellectual disabilities. "My daughter was a smart and caring person," Wea said, adding that Quaweay didn't tell family members she was being beaten. Closing arguments are expected Wednesday.